Tendonitis is a condition that results when the tendon of a muscle gets aggravated and inflamed. Pain associated with tendonitis will usually be worse at the beginning of activity but tends to feel better as the muscle and tendon warm up through continued activity. Most tendonitis occurs after cumulative trauma or overuse of the area. First you need to look at the muscles that are attached to the Achilles and second you need to look at the tissues anterior to the tendon where the structures may become adhered. 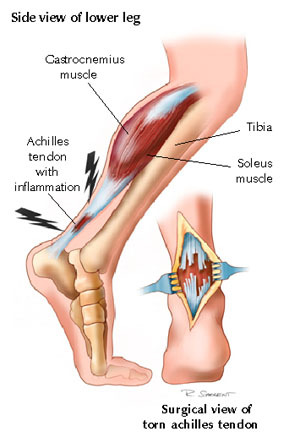 The Achilles tendon is a very strong tendon. The Achilles tendon attaches two large superficial muscles in the posterior lower leg to the calcaneous (the heal). 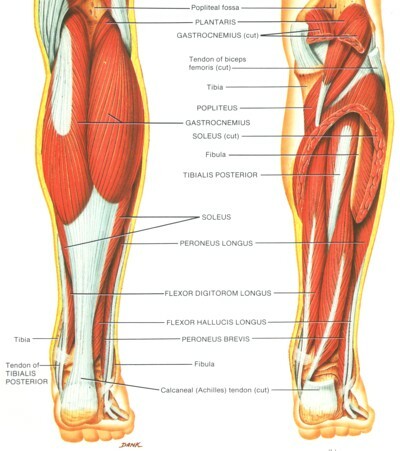 These two muscles are known as the Gastrocnemius and the Soleus. The Gasrtrocnemius attaches above the knee and is the most superficial. The Soleus attaches below the knee with a large portion of the muscle lying posterior to the Gastrocnemius. Both muscles bind into the common tendon and attach to the calcaneous . If these muscles get excessively tight they will pull on the Achilles tendon. This pull and overuse of the calf muscles is generally the cause of tendonitis. Strains and ruptures can also effect the Achilles tendon. These injuries are usually caused by a traumatic event. People often feel tightness or stiffness in the calf muscles prior to experiencing the pain of Achilles tendonitis. The first step in treatment should always be to decrease the inflammation around the tendon and decrease the pull or tension on the tendon. Heating and stretching the calf muscles should help decrease the tension on the tendon. Ice will help decrease the inflammation. Finding an Active Release (ART) Provider in your area is by far the fastest, safest way to loosen the muscles and restore them to their proper length. The second thing to consider is the tissue that lies anterior to the tendon. In the body we have many layers of tissues comprising of muscles, tendons, nerves, fascia, ligaments etc. These tissues are all designed to move independent of each other (i.e. as movement occurs, muscles slide past muscles, nerves slide past muscles etc.). In an area that has had cumulative trauma, these tissues may not slide independently but move as one unit. Why is this a problem? If two structures are stuck together they will not move in their normal range. The major muscles in the lower leg may return to a healthy length but they may be adhered together or the Achilles tendon itself may be stuck to the anterior tissues that it rests on. This will prevent the tendon from moving properly through its’ range of motion which in turn will not allow the tendonitis to fully resolve. Active Release Technique (ART) is the best way to separate these tissues and return them to proper function.